Fellow herbalist, and family friend, Jim Long of Long Creek Herbs recently shared a post about freezing pesto for the summer on his blog Jim Long's Garden. It was quite a timely post as another family friend recently shared a tremendous harvest of large leaf basil with us that was patiently waiting to be turned into pesto for the freezer. Along with the basil, there was a pile of zucchini too. As if Jim knew what was in excess in my kitchen, he shared a recipe for Zucchini Pesto Bread that simply sounded quite delicious. Recipe + ingredients on hand + a free day = make pesto first, then make zucchini pesto bread. It was begging to be made, and with volunteer gardeners scheduled to arrive to help weed and tend the garden, anticipating dinner after their chores, it was definitely the right time to make this bread. So Friday was spent picking basil leaves, whirling pesto in the Cuisinart, and making quick bread. The bread was a hit at dinner, very solid, very moist, very flavorful. Be sure to visit Jim's blog for the recipe, and other herbal inspiration. A friend recently journeyed to Israel, and upon her return, shared some packets of Wissotzky Tea. (Thank you, SB!) This company was founded in 1849 in Russia, and subsequently established tea production in Israel in 1936. They are the leading producer and exporter of tea in Israel with their tea production plant located in Galilee. The Classic tea (shown here) is a blend unique to Wissotzky and is comprised of tea varieties from around the world. It is a smooth drinking, bold black tea, a perfect get-up-and-go tea. What an excellent souvenir to share with a tea lover! For additional information about this company, they have an informative website here. While traveling in England, I first heard about Macarons, the delicate French confection that consists of petite colorful almond meringues sandwiched with a soft sweet filling. They are nothing at all like Macaroons, with two o's. Since then, I've been hearing more about them, seeing fabulous pictures of them on blogs, and drooling over Lauderee's colorful variety of flavors. And then, Angela at Tea With Friends shared her success with making Macarons, and ever since, I've wanted to try my hand at these delicate little cuties, perfectly suitable for the tea tray. Angela posted about her experience in January, and ever since, my desire to make them has been stewing! Then, one day while shopping in ACMoore, I happened upon this fun little recipe book with detailed instructions, beautiful photography, and a myriad of recipes, and into my cart it went. So, I finally took the plunge and made my first batch, lemon macarons with a mascarpone filling. Simply, Yum! Our final stop on the Traveling Herb Seminar was a visit to the Cosy Cupboard Tea Room where we were treated to the Avon Lea evening tea service, with tea and delicacies provided by waitstaff in black and white garb. A variety of teas were offered throughout the evening, including English Breakfast, Cherry Sencha green tea, a herbal blend, and decaffeinated Ginger Peach. Royal Albert Old Country Roses china graced the table accented with beautiful gold flatware. Very festive and royal indeed. A generous salad with assorted toppings and a balsamic vinaigrette was presented as the first course. Individual sandwich plates included a variety of petite sandwiches: egg salad, chicken salad, ham and cheese, cucumber with herbed cream cheese, and a small shrimp salad. All very fresh and tasty. A choice of scones was offered, butter or poppy seed accompanied by a generous portion of cream and jelly. Dessert was a slice of glazed pound cake with a fruit drizzle alongside mixed berries. Owner James Howard proudly states that the Cosy Cupboard Tea Room is Morris County's premier destination tea room. We were pleased to be able to experience this tea room. Henry Wick's prosperous 1,400 acre farm was home to Washington's Continental Army for three very harsh winters (1779-1782). The army built rows of log huts. The Army consumed more than 600 acres of trees to build shelter, cook meals and heat the huts. During the harshest winter (1779-1780) the Wick home itself served as the headquarters for Aurthur St Clair, commander of the Pennsylvania Line. National Park Service of New Jersey, operates this site. The Herb Society America Unit of Northern New Jersey, works to maintain the Wick House Family Gardens. The vegetables and herbs grown in the garden are those you would have found in a Revolutionary Era family garden. The labels in this garden were excellent. Large wood pieces, painted white and then the common name of the plant, its use, and its Latin name were all on the large, easy to read (without bending over) label. A large garden with vegetables, herbs, a few flowers, beverage plants, broom corn (to make booms), medicinal plants and more. It was a fun visit. Shown here, Rhubarb, also commonly known as Pie Plant. 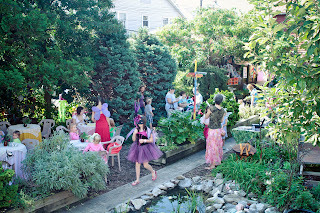 Oh, my photos of Greenwood Gardens, simply do not do this marvelous garden justice at all. Greenwood Gardens combines formal gardens, open meadows, woodlands, and is a true time capsule of New Jersey's past. It was a haven of tranquility for those from the very busy New York Metropolitan area. As you walked through Greenwood Gardens, which has just completed Phase 1 of its extensive restoration, it is so easy to envision what must have been a glorious estate at one time. I could easily see the ladies in their finery strolling the grounds and hear the children running and playing. This is an amazing estate that is listed on the National Register of Historic Places. Our guides were so enthusiastic and eager to share Greenwood with us and that made the tour even more special. Greenwood Gardens quickly transport visitors to an era of country estate, gentleman farmers, and elegant tea parties on wide swaths of lawn. Above is a sampling of the historic Arts and Crafts-inspired architecture. This out building is the Tea House, complete with tiled floor, a water source and a fire pit to heat the water. Below, a rainy day, but an amazing view back toward the house. Matilda was the only daughter of George G. Frelinghuysen, a patent attorney and Sara Ballantine of Newark, the granddaughter of the founder of the P. Ballantine Brewing Company. Shown here is Matilda's Tea Garden, full of flavorful herb plants that can be brewed by themselves for a tasty caffeine free beverage, or dried and added to black tea to add subtle flavor. Although difficult to discern, this cute little tea garden is outlined with bricks to form the shape of a tea pot. Just another one of the clever little nooks and crannies to be discovered while strolling the grounds of the Frelinghuysen Arboretum, a gift bequeathed to the people of Morris County, NJ from Matilda. Our most recent bus tour was to New Jersey, The Garden State, and it did not disappoint! While the weather was overcast with a rain shower here and there we had a wonderful day visiting three interesting gardens and a tea room, too. All within about 20 miles of each other! Our first stop was Frelinghuysen Arboretum. A little jewel in the Morris County Park System, this estate was left to the county by Matilda Frelinghuysen with the plan that it was to become an arboretum. What we loved about this stop were all the nooks and crannies and how they were filled in with an interesting display. Shown here, is a fernery nook. All ferns were well labeled and tucked in a boxwood alcove. Even the furniture in front featured a cut out fern design in the iron bench. Turn the corner again and there is a little water garden and rock garden display. Fall color in the garden was warm and inviting. Knot gardens are always fun to see and this one was particularly full and attractive. The original home on the estate now houses mostly offices but it is open to walk through and to enjoy the vistas from the home. We're off on a Traveling Herb Seminar today... to gardens in the Garden State of New Jersey. We anticipate a visit to the Frelinghuysen Arboreteum, the Wick House Herb Garden and the Greenwood Gardens with a dinner stop at the Cosy Cupboard Tea Room in Convent Station, NJ. But, before all that happens, our travel companions enjoy a Morning Snack aboard the bus. The featured snack for this trip happens to be Buttermilk Scones with a few blueberries and cinnamon chips tossed into the mix. Preheat oven to 425 degrees. Combine flour, sugar, baking powder, baking soda, and salt. Cut in butter until small pieces are formed. Toss in cinnamon chips. Add buttermilk, mixing just until dry ingredients are moistened. Carefully add blueberries. Knead a few times on lightly floured board. Cut dough in half. With half of the dough, form a large ball, and gently flatten into a 6" circle with a rolling pin. Cut circle into 8 triangles. Repeat with second ball of dough. Brush with egg white, sprinkle with sugar. Bake 13 minutes, until golden. Yum! The creative sisters at The Essential Herbal Magazine have done it again. 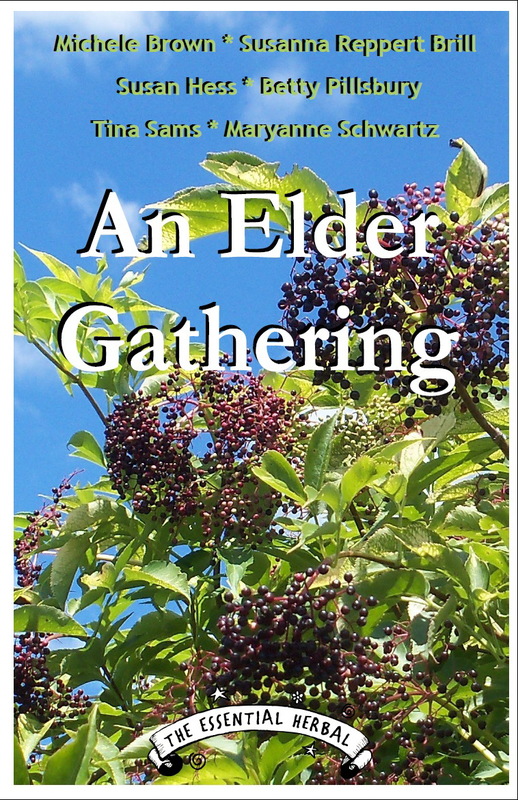 They pulled together a group of fellow herb lovers, with each writing a chapter on Elder. Here is what Tina Sams has written "Come along and join us, a group of long-time friends, as we share our favorite uses for elder flowers and berries. We've even got a few uses for leaves and wood! Learn about growing, harvesting, preserving, making medicine, delicious dishes and tantalizing teas all using this very versatile native plant. Over 30 recipes, remedies and crafts are included, along with light-hearted folklore and good lots of pictures to help you identify Elder. We're certain that soon you'll love the Elder as much as we do, and be finding a place for one (or more) in your yard or garden." The book is available as a pdf download from www.TheRosemaryHouse.com and also from the websites of each of the contributors. 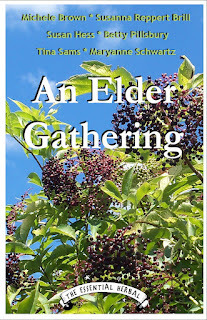 It is 40 pages, prints out as an 8 1/2 x 5 1/2 inch book and it is only $5.00 for a huge assortment of information This amazing book about Elder is written by Michele Brown, Susanna Reppert Brill, Susan Hess, Betty Pillsbury, Tina Sams and Maryanne Schwartz. 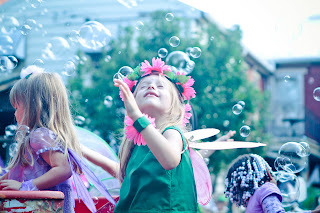 It's Fairy Festival time! This weekend, Saturday Sept. 8 and Sunday 9, from 10 am - 4 pm, rain or shine! 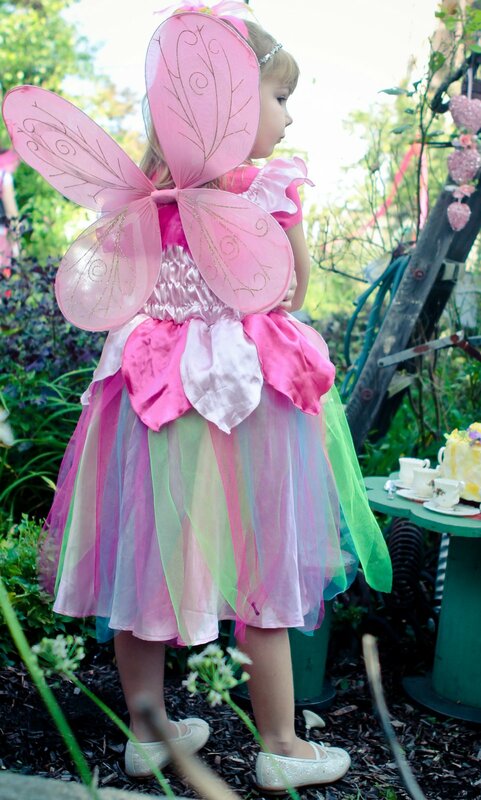 Fairy Rose Fairy will join us on Saturday, Posie the Fairy will be here Saturday and Sunday. 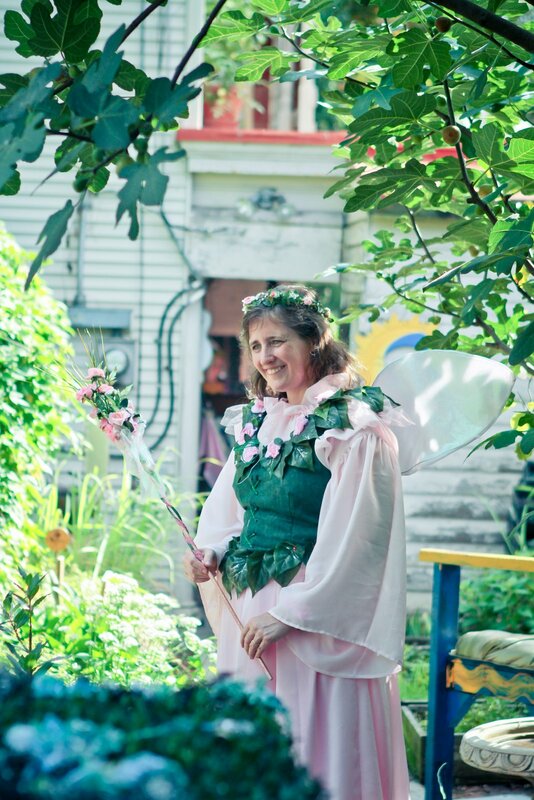 Come frolic in the gardens! Crafts! Some included in the admission price ($5.00 per adult, children under 16 are Free when accompanied by an adult). 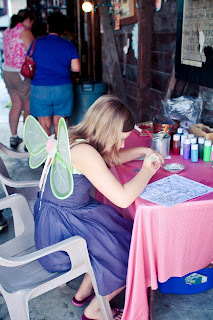 Other crafts have a nominal fee. 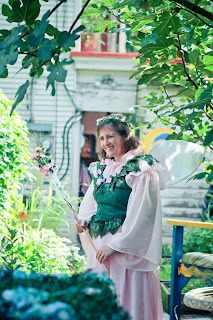 The gardens are full of fairies! Full of surprises! Full of hidden treasures! Yours to discover! Creativity and inspiration. 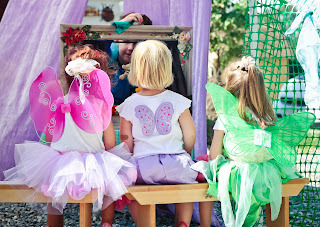 Magic and make believe. Come, have fun with us this weekend. There is a new blog series going on... Tea Friends Who Blog.... compiled by Denise at Uniquely Tea. Denise is an American, married to an Englishman, living in a quaint village in England, sipping tea and sharing stories. She has a wonderful blog, a collection of bits and bobs solely about tea. This month, she is sharing about the many different tea related blogs available, and yesterday was the feature about Rosemary's Sampler. This is a photo of Denise, taken in 2007 at the T Palace (no longer open) in London when Nancy joined Denise and others on a Tea in London excursion. It was a wonderful and memorable experience, and the perfect way to experience London! Denise is organizing another Tea in London adventure in the autumn of 2013. Chocolate Mint Mousse and more! There was a myriad of desserts at the tea infused luncheon. Chocolate mint mousse, a delicious sorbet, the matcha crispy treats. It was a fun event... thanks for reading along! There will soon be the option to have all the recipes that were featured at this special event. As soon as the details are available, we'll be sure to post the information. In the meantime, be sure and try to add tea to something your cooking. Consider tea to simply be an extension of your herb and spice cabinet. Be creative! Begin with rice and instead of using plain water, steep some tea in the water first, and then cook your rice in the tea infused water. Think of the possibilities! Any recipe that calls for water can be substituted with a tea infused liquid. You might be surprised with the results! Finely ground tea leaves can be added to simple sugar cookies or a plain tea bread for extra punch. A lemon tea bread would be delicious with the addition of ceylon tea leaves that have been finely crushed. Let some tea steep overnight in whipped cream so the flavors blend. Remove the tea leaves the next day and whip as usual for a distinctly unique whipped topping for dessert. Harney & Sons Hot Cinnamon Spice tea would add a wonderful flavor to whipped cream served atop apple pie. Have fun! Of all of the tea infused recipes, to my taste buds, these Crispy Treats prepared using Matcha (powdered green tea) had the most intense actual tea flavor. Gail Gastelu of Tea House Times arrived with this new take on an old familiar favorite. The recipe can be found on the Aiya Tea website, here. Gail also provided sample packets of matcha for each of the attendees to take home. It is noted on the packaging that Matcha is high in antioxidants, aides mental focus, and provides natural energy. One of the newest members of MATBA, Kirk Barbour, provided a recipe for Earl Grey Sally Lunn bread along with a bit of history regarding this famous Bath Bun. Sally Lunn is a yeast bread that was popular in England's West Country, taking its name from the Sally Lunn House in Bath, UK. It is a mystery as to who is Sally Lunn, although some speculate that she was a French Huguenot refugee, named Solange Luyon who arrived in Bath around 1680. Sally Lunn bread has appeared in various forms around the world, however the original resembles a French brioche. Additional information about the Sally Lunn Bath Bun can be found on their website, here. In the 1900's, recipes for Sally Lunn even appeared in some Pennsylvania German cookbooks. The recipe that Kirk shared is an adaptation of a recipe submitted by Nancy Roan of the Goshenhoppen Historians and was found in the second edition of the regional cookbook, Boyertown Area Cookery, published in 1991 by the Boyertown Area Historical Society, Boyertown, PA.
Preheat the oven to 375 degrees. heat the milk until it just starts to boil, remove from heat, and infuse 1 tsp. of Earl Grey tea. Pour the tea-infused milk into a large bowl. Stir in the sugar, salt, butter, and another tsp of Earl Grey tea leaves. Then add the yeast and water. Beat the eggs and add to the other ingredients in the bowl. Then gradually work in the flour. Cover the bowl and allow the dough to rise for 45 minutes. Place the dough in a bundt pan. Bake for 30 minutes. Slice and serve with jam, marmalade, clotted cream, or lemon curd. My contribution to the MATBA tea infused luncheon included a plate of Candied Ginger and Green Tea Bread. The original recipe appears in the book Eat Tea by Joanna Pruess with John Harney (2001, The Lyons Press). A nice firm tea bread, it used finely ground tea leaves coupled with small pieces of crystallized ginger. I used Harney & Sons Ginger Peach tea for the 1/4 c. of finely ground tea the recipe uses. Served with mascarpone cheese, it's a nice addition to an Afternoon Tea. Eat Tea is a fun cookbook that includes a wide assortment of unique recipes. I've made several of the recipes in the book, including Green Fruits in Jasmine Tea Syrup. This is such a tasty recipe, and very pretty as it uses green fruits, kiwi, honeydew melon, green grapes, and fresh mint with a lovely jasmine infused sugar syrup glaze. So refreshing! When we held our Cooking With Tea Dinner at the tea room in 2005, I also prepared the Savory Swirls that are in this book. My notes, written alongside the recipe, say that it was easy, a do-ahead recipe, and had a very good tea flavor. Sounds like one I need to make again! Another tasty recipe from this book, also served at the Cooking With Tea Dinner, is the Pear, Gorgonzola, and Watercress Salad. It has a tea vinaigrette that complements the sweet pears and tangy cheese. My note, 'popular'. Needless to say, of the recipes I have tried from the book Eat Tea, they have been successful. One of the delicious desserts served at the Mid-Atlantic Tea Business Association pot-luck Afternoon Tea featured this platter of individual ramekins filled with Baked Peaches with Ricotta and Harney & Sons Peaches & Ginger Tea Streusel.